After 5 short hours of sleep I forced my eyes to open since I couldn’t wait to see the view in the morning. Falling a sleep while counting the boats was amazing, waking up and seeing an all glittering bay was even more amazing. Kowloon is all about Luxury, fake and constructions. If it wouldn’t have this amazing view to Hongkong Island it wouldn’t be a place where I want to spend my day. My original plan was to go shopping their, until I realized that everything on this site costs as much as my whole trip, so I decided to walkt to the West Kowloon Park and to the ICC and drive up to Sky100. Well, the heat was real, the sun was out, the wind was gone, there was no shade at all and when I arrived at the park it took me two water bottles to calm down and finally enjoy the amazing view. This Promenade is probably full of locals and they get together and have a picnic to wait for the sun to set . Well not me. Made my way to the ICC and realized I have no clue how to get to the entrance without walking another 20 min. so I jumped onto the Subway and drove to the Avenue of Stars. Didn’t walk the Avenue since I just don’t wanted to. When I travel alone I’m always on the fast lane. I never stay somewhere longer than 20 minutes, I always pass everyone and have the feeling I need to make my lovely wrong turns really fast. So at the end I’m always out of power. So I often need to remind myself to put away my camera just sit still and soak it all in. Realizing you’re at the place you always wanted to go right now at this moment is my favorite part of traveling and it always puts an huge smile on my face. So I decided to skip the Avenue and just sit down at the waterfront for 2 hours, enjoy the sunset and the (really wired) Lightshow at 8pm. And on the way home with the ferry I packed my camera in my bag and just enjoyed being where I am, feeling the wind on my skin, seeing the lights around me and hearing the waves under me. 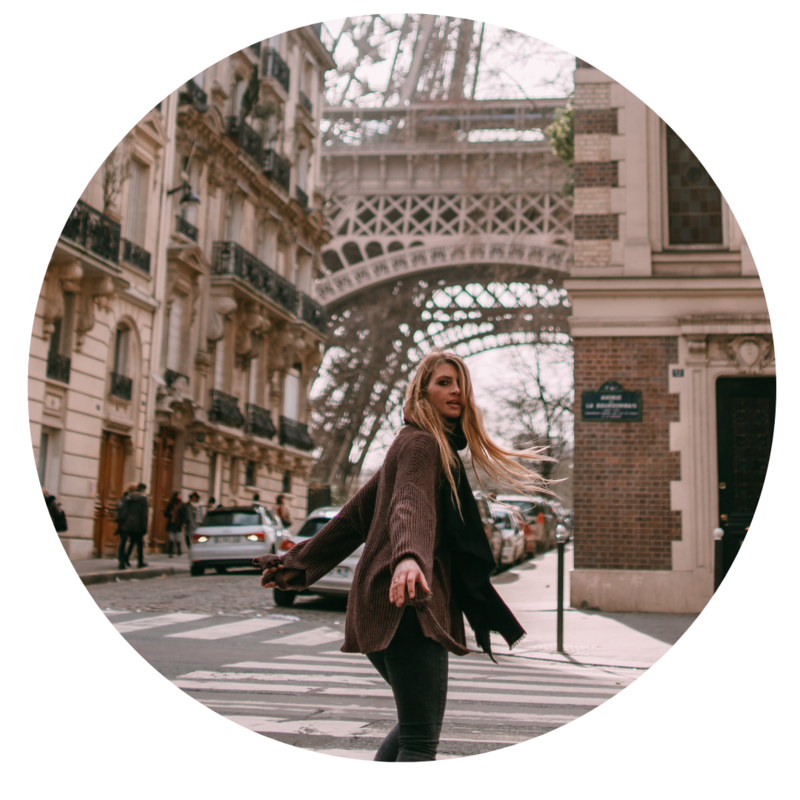 Mia - Worldsessed Creator- is worldsessed, loves photography and sharing her adventures with you, so you feel like, you need to go and make your life more amazing. Really enjoyed all of your pictures! Beautiful post. I LOVE Hong Kong. The skycrapers, the alleys, the night markets, the FOOD! Your photos are amazing and it makes me want to go back and since it’s only an hour flight, I think I just might while I’m still in Asia. I was only there for a limited time so I’m sure there’s a lot of things there that I’ve yet to explore! While your pictures are gorgeous (and have a lovely filter) I do agree with it feeling a little synthetic, what with all those glass and chrome buildings around! What a nice gallery of beautiful pictures. It may be fake, but it is still beautiful to see. I enjoyed a lot this photographic journey to Hong Kong, a city that I am yet to visit! What a beautiful post, all the pictures gave me a great idea about this city that I really hope to visit soon! Thank’s for sharing you way to view the city! I just went to Hong Kong last month for the first time, and I had a great time there! It’s great to just sit back and relax, soak everything in after productive day. What did you think about the lightshow? Is it what you expected? Also, great photographs you have! What camera do you have? It looks so beautiful at night with all the lights! Great shots. As much as you say it’s fake and superficial, you’ve managed to capture the place beautifully in your photos! Wow! Lots of great photos. I really regret not visiting Hong Kong when we lived very close by. I’ve been to Hong Kong but didn’t like it there there’s not much to see that those tall buildings. HK is one of my all time favourite cities! Great photos! YES thank you! I’m traveling to Hong Kong this December.. can’t wait. I need articles and photo diaries like this!